markkfinn read my blog post "Google Chrome Tips and Tricks: Print Friendly" and asked if there was a way to just select part of the page to print from the internet. I thought back to the good old days when I used Internet Explorer and you could just highlight a certain paragraph or two and then right click on it and then say print and then click on the "selection" option. My initial find was "Print Friendly" and it works great. 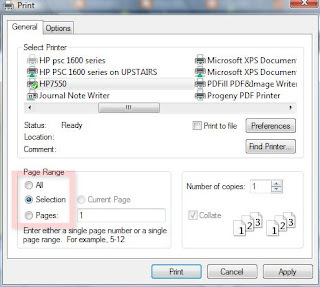 Print Friendly comes close to that except that it creates a copy of the whole page and then you select the parts you don't want and get rid of it and then print. So the question, if I understand it correctly was "How do you get Chrome to do the same thing?" Well I found an answer and I have already blogged about part of it, I just didn't think of this option until the question was posed. 1. Install the Google Chrome Extension "IE Tabs Multi." 2. Once the extension has been installed go to the desired web page from which you would like to print a part of. 3. At the top right of your Chrome browser you should see the "IE Tabs Multi" button. Click on it. 4. You will notice that your tab at the top has changed to the "IE Tabs Multi" icon. 5. You will also notice that you now have another Address bar that looks a little different. 6. These changes prove that your are now using Internet Explorer within the Google Chrome browser. 7. Now just select the text you want to print. Right click on the text and then click the "Print" options. 8. This will now pop open printer dialogue box. 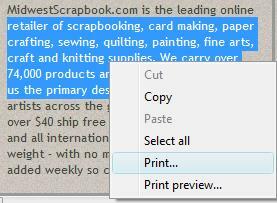 Make sure you choose the "Selection" option/radio button, and then click "Print." If all went well it should have just printed the selected portions of the screen. 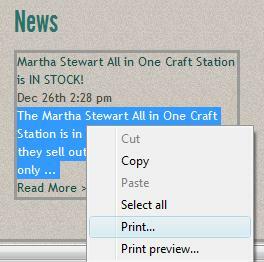 There is a simpler way of doing the same, you can just install Print Selection extension: https://chrome.google.com/webstore/detail/gbkdpdnociibpkkpjgmcmdlnjlebpajk it adds a "Print selection" item in popup context menu, so you could print selected content on the page using standard Chrome's print preview with just 2 clicks.